In a night of fireworks, it is hard to pick the one moment that captures and represents the height of the game. It may have been O.J. Howard’s wide-open touchdown reception next to a bouncing Lane Kiffin, his first since 2012. Or maybe it was Wayne Gallman’s 39 yards after the catch in the waning minute of the game, reversing field, breaking tackles, and refusing to go down. Maybe the unwavering calmness of Deshaun Watson at every point in the game. Last night was full of moments, but it was the one immediately after time expired that characterizes the game and the season as a whole. Jake Coker dropped to his knees as his teammates rushed over. He seemed exhausted, and perhaps he was, but the exhaustion wasn’t the reason he needed a moment to get back to his feet. It was the joy, the validation, the pure emotion that comes with complete commitment. It reminds us why the game is played. Coker’s night looked as great as you could hope for. He finished 16 of 25 with 335 yards and 2 touchdowns, and a three yard run on 3rd and 2 which allowed Alabama to score on its new set of downs and seal the win. The Clemson defense was giving him fits all night, sacking him multiple times and applying pressure on what seemed to be every play, but he and his Crimson Tide teammates kept on with Nick Saban’s simple statement: finish. A tough task considering Clemson entered the game having won 51 straight when leading in the 4th quarter, but one they would live up to. 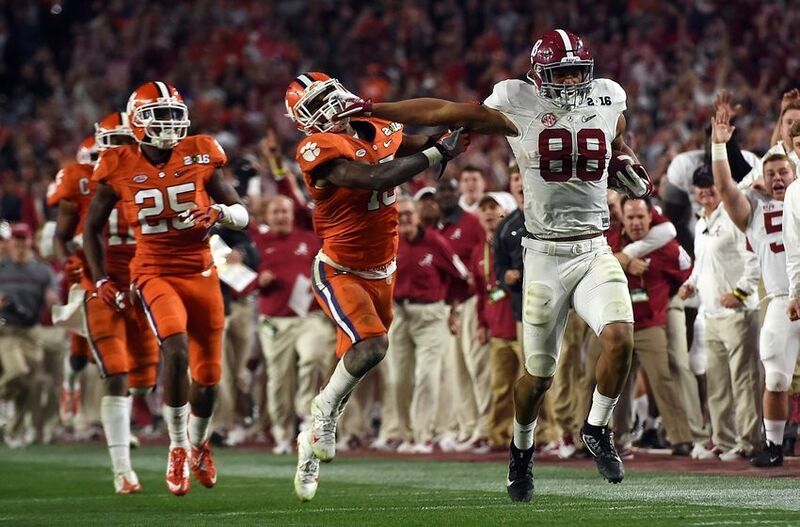 Calling the Clemson Tigers a losing team somehow seems wrong after last night’s performance. The team lost nine defensive starters to start the year, but Dabo Swinney and Brent Venables showed that they are a combination that knows about resiliency and how to win. Defensive back Mackensie Alexander left the game early but the oppressive end duo of Dodd and Lawson wouldn’t let up. The entire team refused to let up. They answered a kick return for a touchdown with a 75 yard scoring drive of their own. They went 68 yards to the end zone in 55 seconds with time nearing its expiration. The defense will again lose a few stars before the 2016 season kicks off, but will get to enjoy Deshaun Watson for at least another year. The true sophomore is as talented as they come on any stage and he showed that last night under the bright lights in front of a national audience. He was sacked only twice and his ability to escape pressure with his legs was only matched with his impressive arm strength. He threw for 405 yards and 4 touchdowns in a performance that would have normally been good enough for a win. Saban wasn’t ready to pick his favorite championship team by the end, but he hinted that his 2015 group could be at the top, and the top is where Alabama remains. It’s a platform that could easily be occupied by both teams, but there’s only room enough for one. Game after game, year after year, the Tide keep rolling.